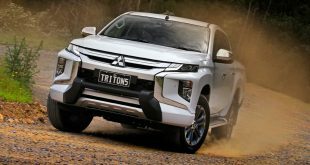 The Mitsubishi Triton is the best-selling model in Mitsubishi’s Australian lineup – and its sales figures in Australia are trumped only by those in Thailand where it’s produced – so now that it’s been given a major refresh for 2019, the pressure is on to see if Mitsubishi have got it right. 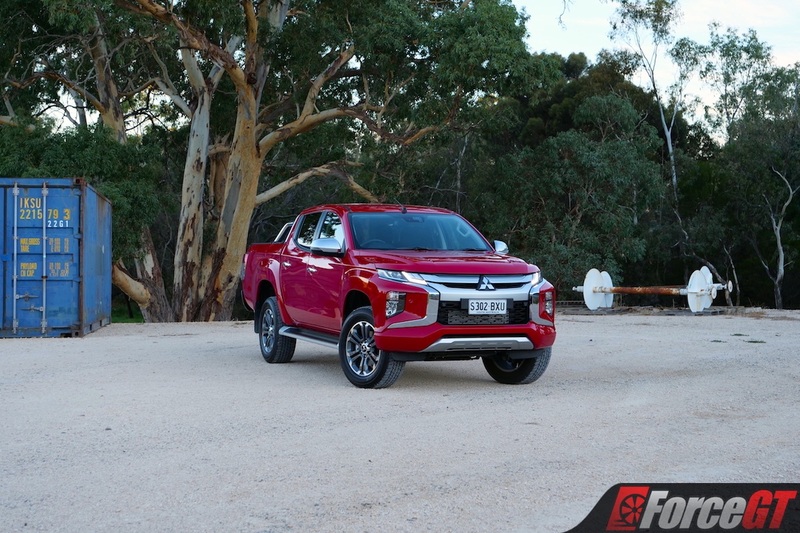 Although pricing is up for 2019 models, the Triton remains one of the more affordable utes on the market, with the range spanning from the $22,490 petrol-powered GLX Single Cab Chassis 4×2 all the way to the $51,990 GLS Premium Dual Cab 4×4. 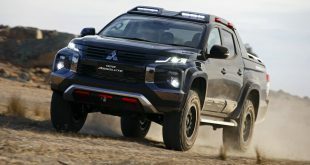 The aim for Mitsubishi with this refresh was not just to alter the Triton’s looks, but to also cement its place as one of the best-equipped utes on the market for the money, especially in regards to its levels of active safety tech. 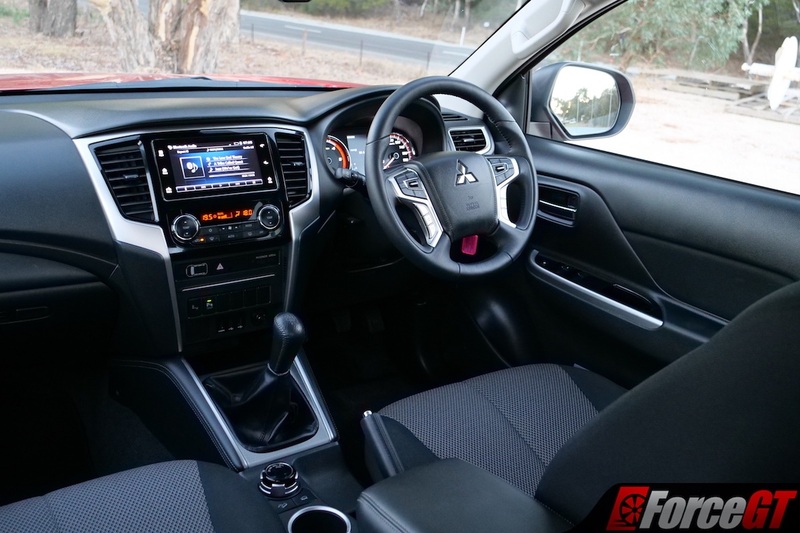 On test we have the well-equipped, private buyer-focused GLS – which is only offered as a Dual Cab with four-wheel drive, and sits below only the kitted-out GLS Premium – to see if they’ve pulled this facelift off. Worth noting is that prior to this refresh, the GLS was the sales leader in the range. 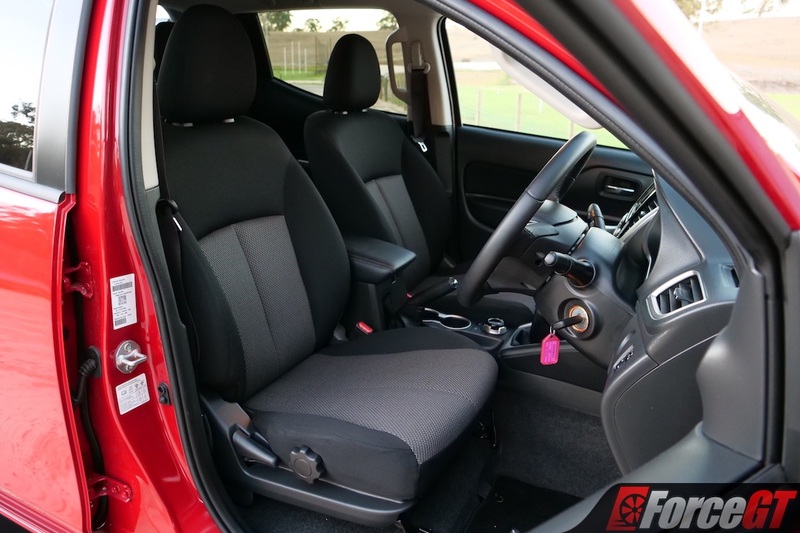 Our manual tester is priced from a very reasonable $44,490 before on-road costs – although at the time of publication, it’s on offer for that figure drive-away – while the automatic commands $2,500 more. 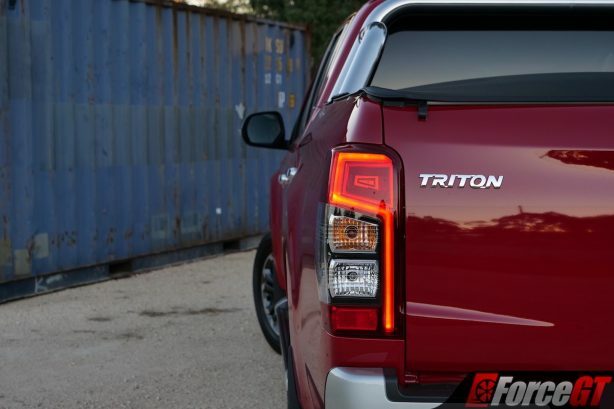 While what you see here might look like an all-new Triton, it actually isn’t. 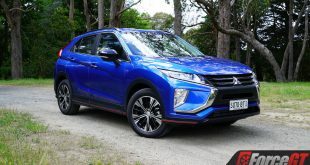 What’s really going on here is a rather radical facelift that sees an entirely new front end from the windscreen forwards, with the Triton now adopting a very similar facia to that of the closely-related Pajero Sport and the Eclipse Cross. 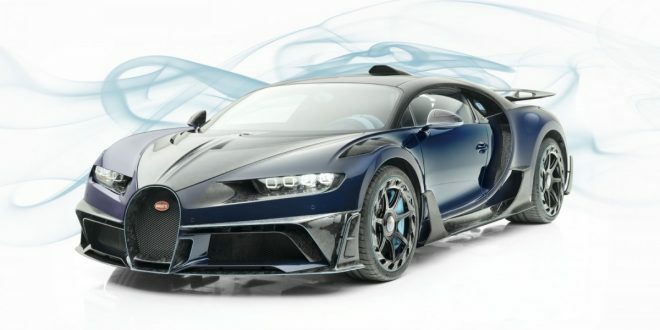 Personally, I don’t mind the new look as it helps the Triton finally look more aggressive, although many friends who saw it weren’t quite so positive about its new face. 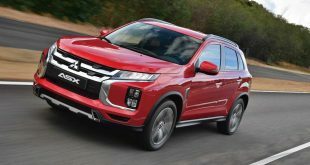 The rear-end has also been redesigned with new quarter panels, teardrop taillights, and a big chrome tray release handle, and a new 18-inch alloy wheel design for GLS and GLS Premium models helps to compliment the largely new exterior design. 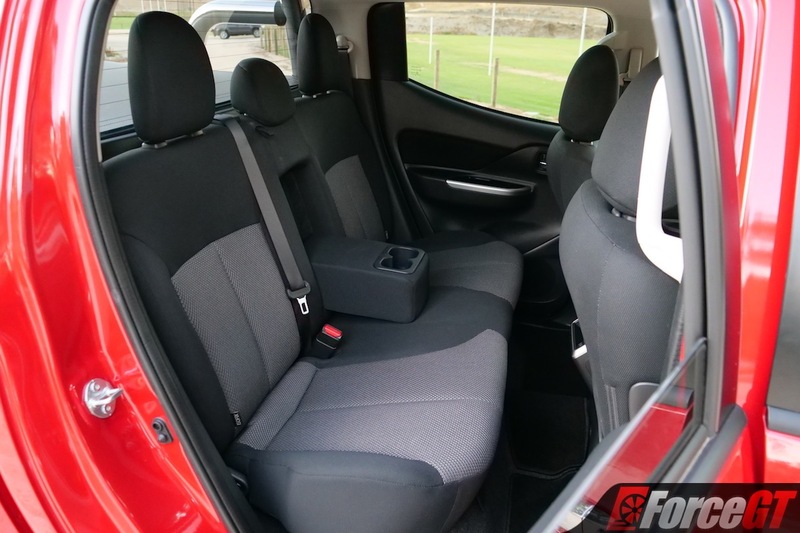 The Triton’s interior has also been given a spruce up as part of the facelift, with better materials including softer padding on the centre armrest, sides of the centre console, and door cards. 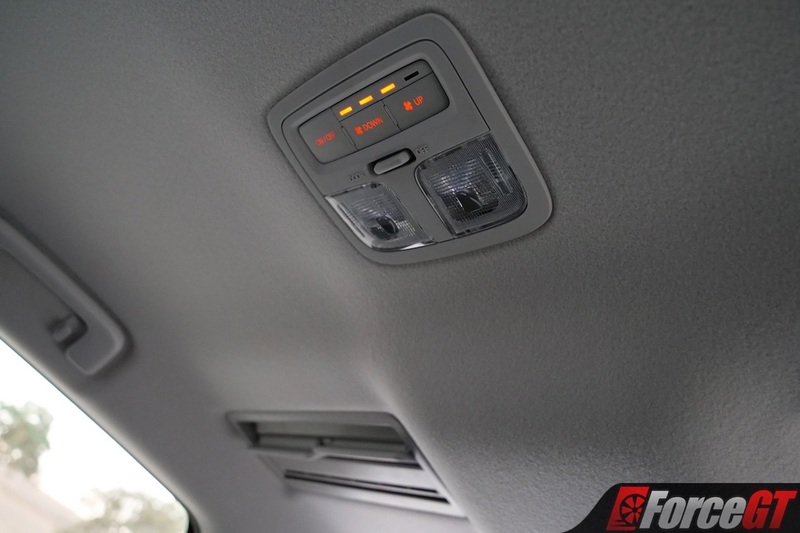 There’s also the addition of some roof-mounted rear air vents and A/C controls for dual cab models to help those relegated to the rear seats breathe. 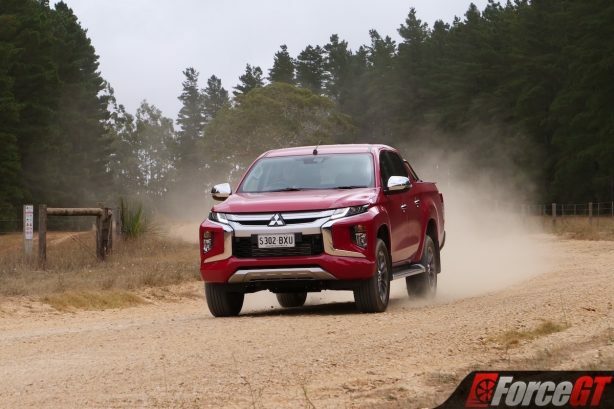 Mechanical changes are fairly limited for the facelifted model, with Mitsubishi having focused primarily on enhancing the Triton’s styling, but what changes have been made are ones that won’t go unappreciated. 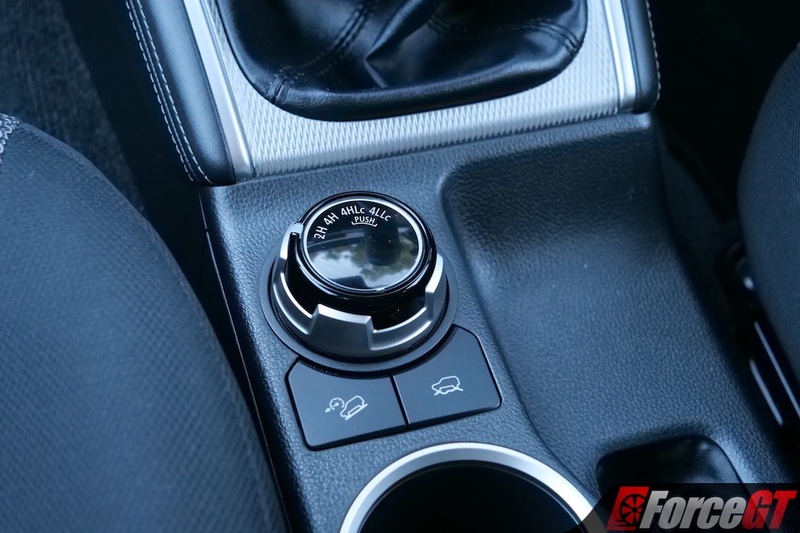 Most notably, all automatic variants of the 2019 Triton see the dated five-speed transmission swapped out for a six-speed unit offering better gearing for highway and country driving. Additionally, larger shock absorbers have been fitted to the rear of the ute making for better bump absorption for the leaf-sprung rear axle. 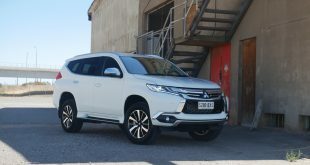 However, one negative affect of the facelift has been a bit of weight gain which has affected payload – reducing that of our GLS tester by 38kg – and a less aerodynamic front end making for increased fuel consumption across the range, although the claims are still quite frugal, ranging between 7.9-8.6L/100km depending on the variant. 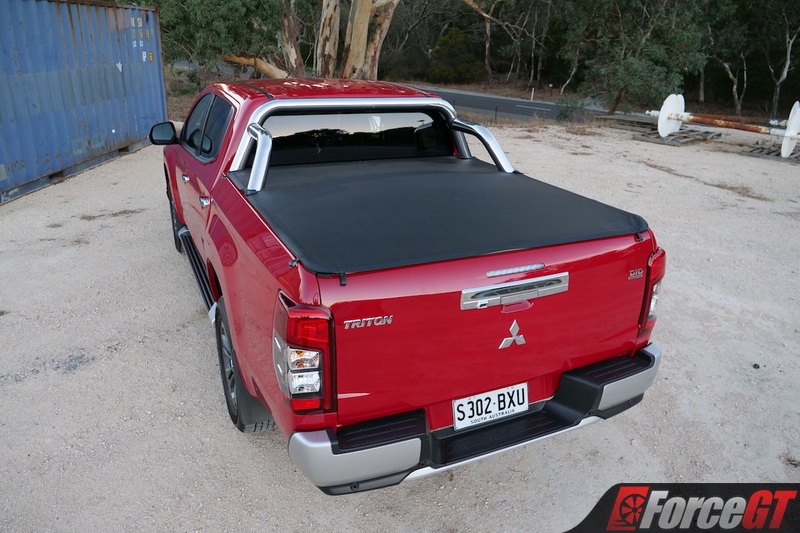 Perhaps the most impressive trait of the Triton is its unparalleled level of standard safety equipment, which isn’t even matched by a lot of the more expensive utes out there. 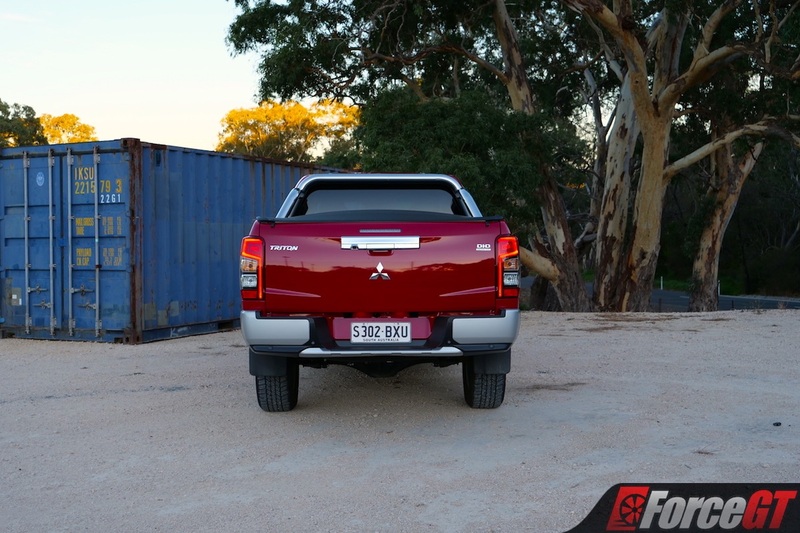 As far as active safety technology is concerned, it offers Forward Collision Mitigation with pedestrian detection, Lane Departure Warning, Blind Spot Warning, Rear Cross Traffic Alert, and Lane Change Assist as standard, and as crazy as it sounds, the vast majority of utes fail to offer many of these important features, and it’s highly commendable for Mitsubishi to have equipped the Triton so well for the money. 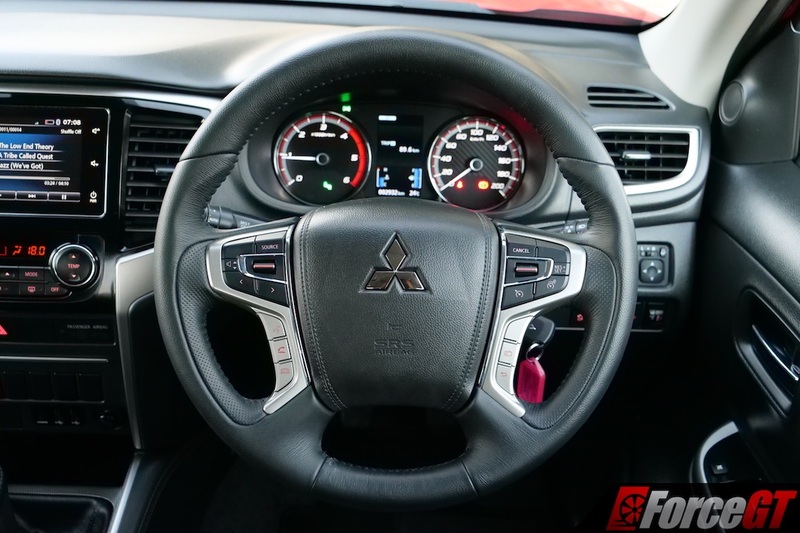 Additionally, seven airbags including a driver’s knee airbag also feature, further helping to bolster its 5-star ANCAP safety rating. 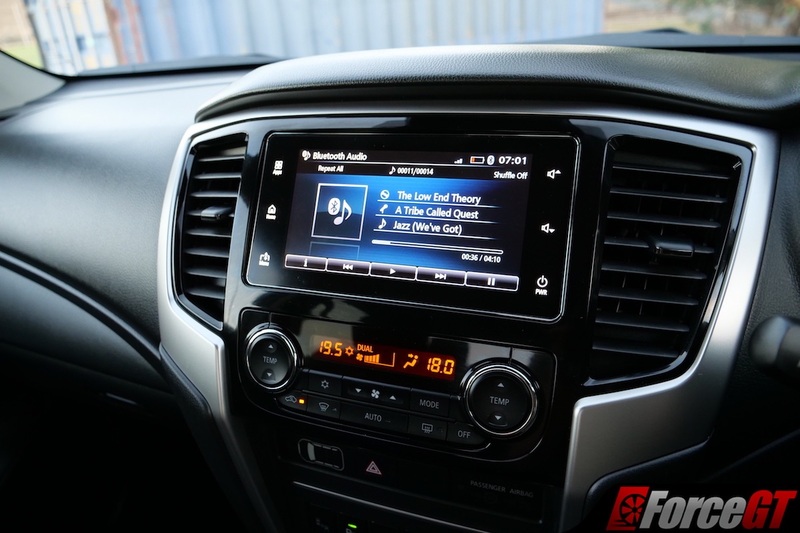 A number of convenience features not seen in all rivals also feature as standard on our GLS tester, including automatic wipers, automatic headlights with automatic high beam control, both front and rear parking sensors, dual-zone climate control, and Apple CarPlay and Android Auto smartphone mirroring on its 7.0-inch touchscreen. 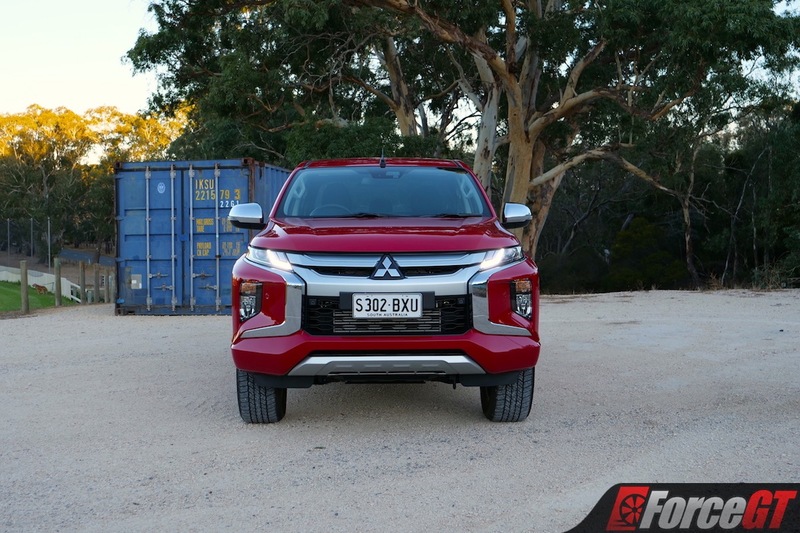 Under the bonnet of all Tritons – bar the price-leading petrol-powered GLX Single Cab – is a carryover 2.4-litre four-cylinder turbo diesel, which retains the same outputs of 133kW and 430Nm, placing it in the middle of the pack when it comes to power. 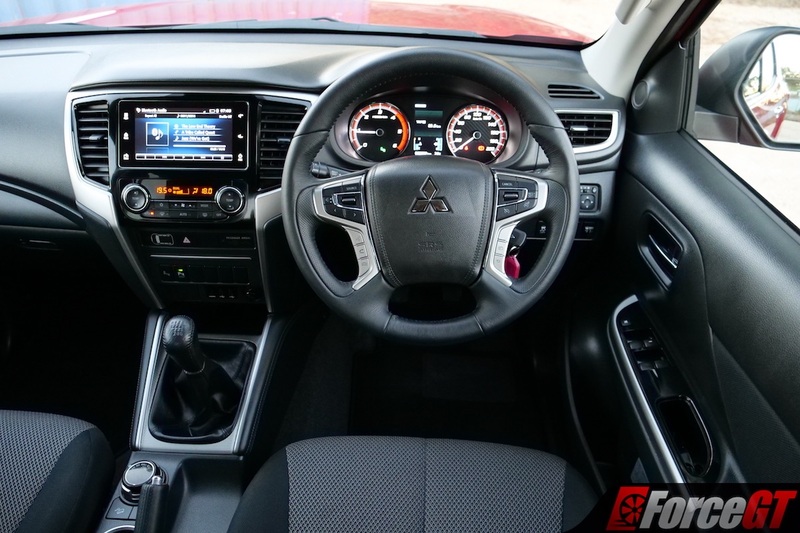 In our tester, it comes paired to a six-speed manual gearbox and Mitsubishi’s Super Select II dual-range four-wheel drive system which offers both on-road and off-road four-wheel drive modes. 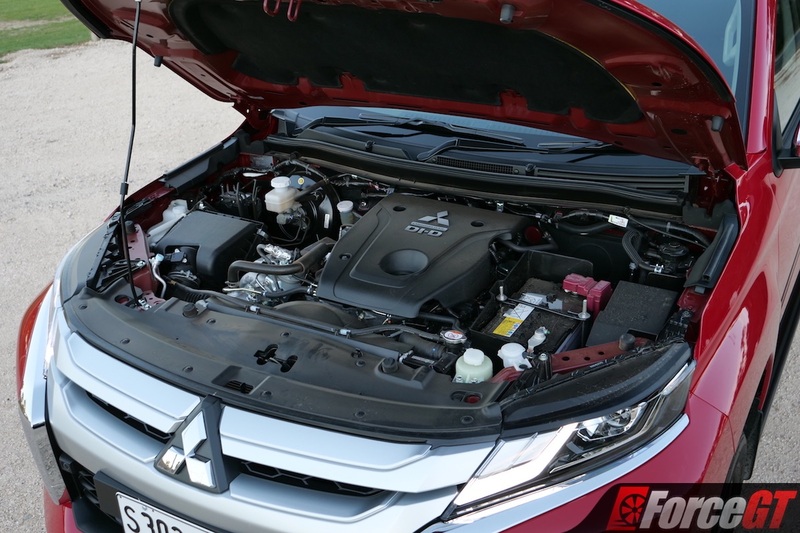 Fuel consumption for the GLS Manual is listed at 7.9L/100km, and after 630km of mixed driving including time spent hauling loads and off-roading we saw an indicated return of 9.1L/100km. 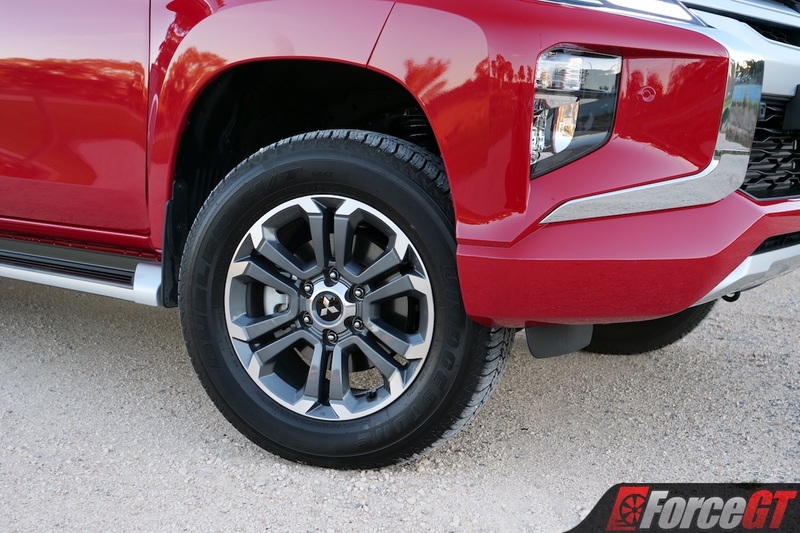 As is standard for most utes, it’s underpinned by double wishbone front suspension and a leaf-sprung live rear axle, with front disc brakes and drums in the rear. 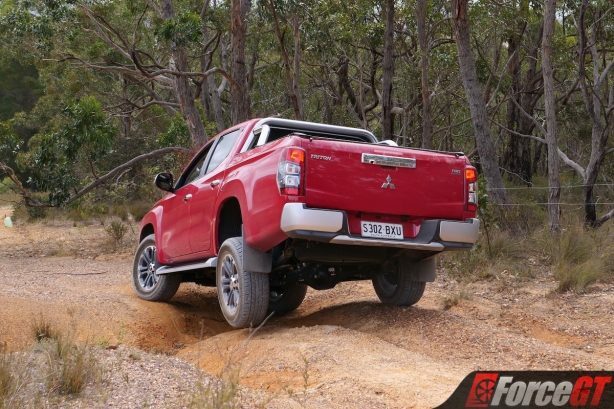 Braked towing capacity is is listed at 3,100kg, meaning it does fall behind many of its rivals that can tow 3,500kg. 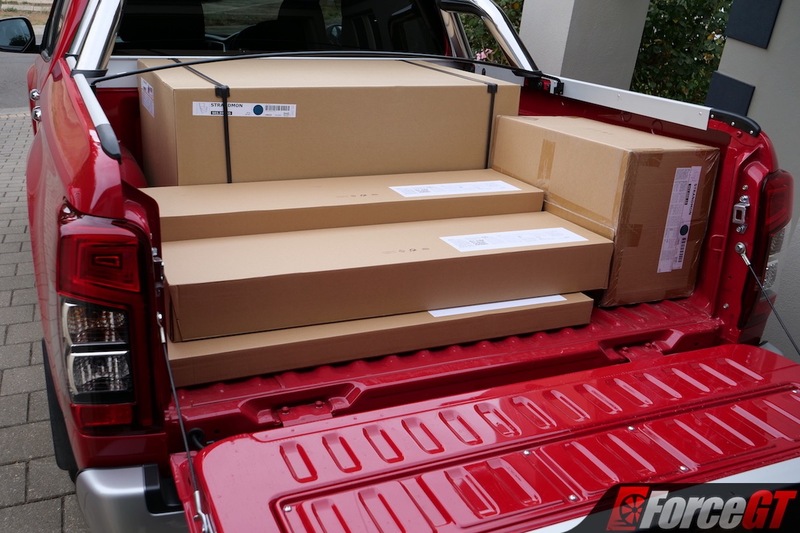 Its payload is now down to 906kg for our GLS Manual tester due to its higher kerb weight, meaning it’s about on par with the much-derided coil-sprung Nissan Navara, although it doesn’t exhibit nearly as much sagging in the rear when loaded up. 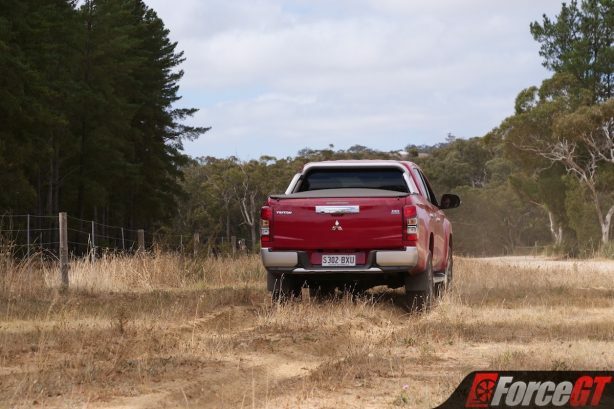 Our initial impression of the revised Triton as soon as we got behind the wheel was that those larger rear shock absorbers have gone a long way to improving its rear ride quality. 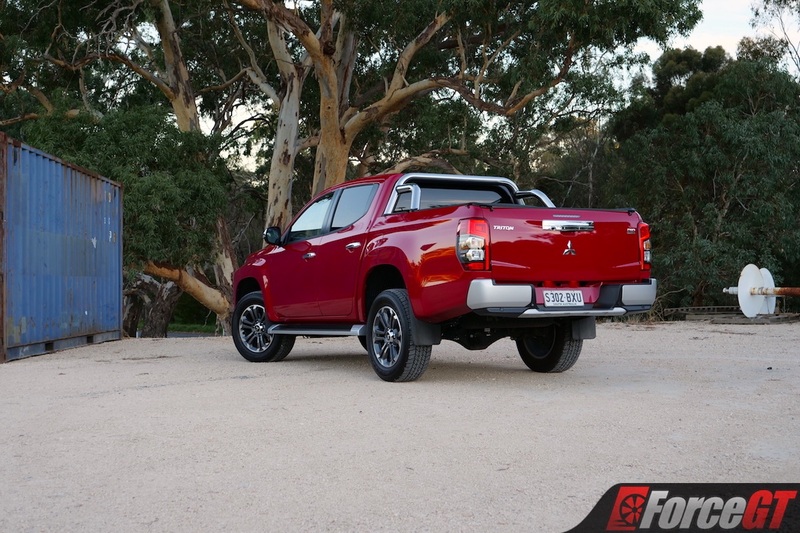 While it certainly still can be bouncy at times when unladen, as is characteristic of most utes, it’s now nearing the top of the pack when it comes to overall ride quality. 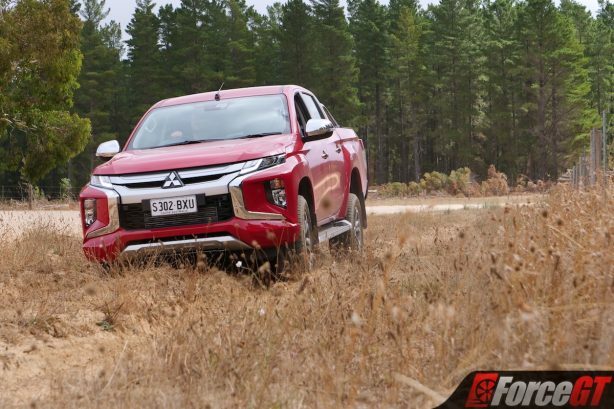 The offering of an on-road four-wheel drive setting which leaves the centre differential open is a big help, particularly in the wet, as it helps the Triton feel far more tractable than many rivals that can only send power to the rear wheels on sealed roads. 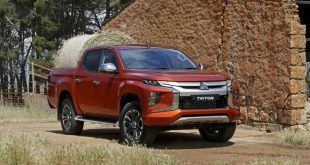 Like most utes, the Triton has old-school hydraulic power steering which, while a tad slow at low speeds, does feel well-weighted and fairly direct. 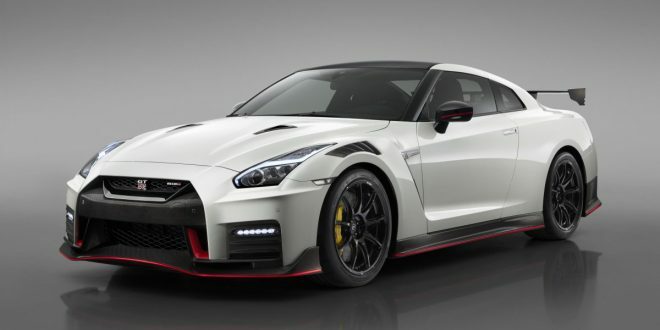 On a twisty road, it’ll remain fairly composed, with an acceptable amount of body roll and good communication of what the front wheels are doing through the steering wheel. 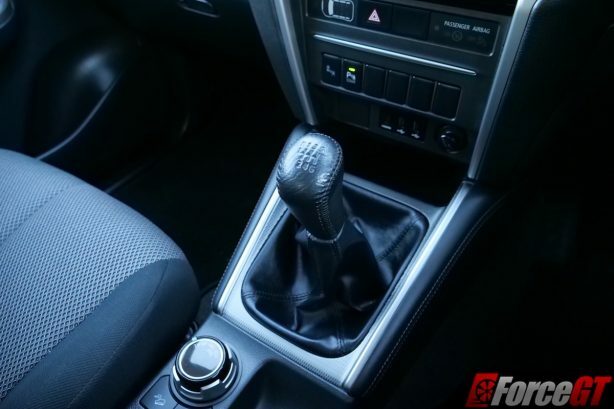 The six-speed manual gearbox’s shifter feels slightly notchy and has fairly long throws, which, while a tad truck-like, suited the character of the Triton and did make shifting easy with it clear to tell which gear you’re in. Likewise, the clutch pedal felt very communicative thanks to its long travel and clear bite point, and wasn’t overly heavy, although the clutch in manual Toyota HiLux models does feel a tad easier. 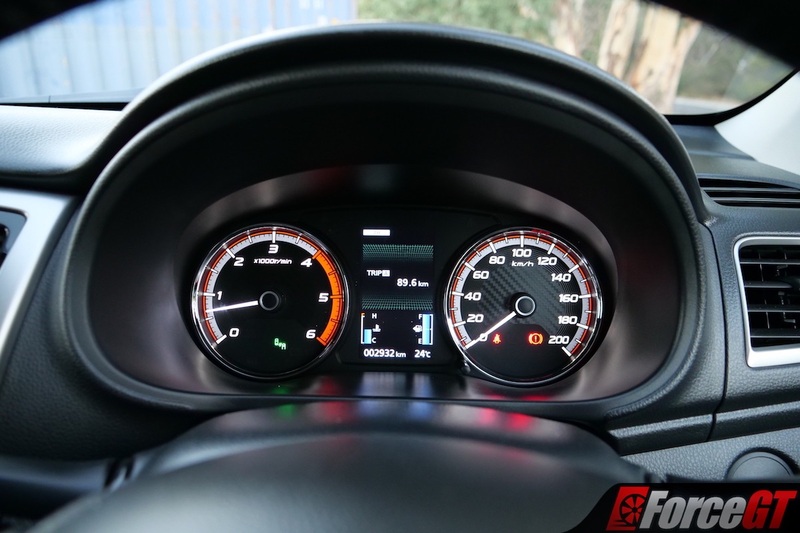 And do take note of those thoughts, as one thing you’ll be doing in the Triton is shifting gears a lot. 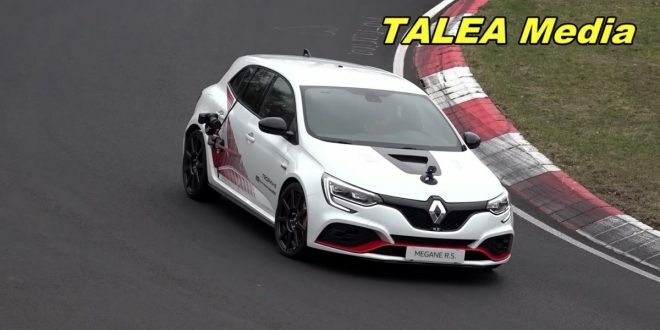 With peak torque coming on at a fairly high 2,500rpm, and not a great amount of sheer power on offer from the 2.4-litre oiler anyway, it’s easy to get caught out and have little happen when you put your foot down without downshifting a couple of cogs, as third gear distinctly feels to be where what power it has hides. 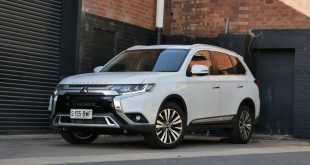 With that said, the relatively small engine under the bonnet doesn’t feel strained with a load in its very well-sized tray, although we’d be interested to see how it performs towing – something we weren’t able to do as our tester wasn’t equipped with a towbar – considering its 3.1 tonne rating, which trails behind the 3.5 tonne rating of most rivals. Complementing its good on-road manners, we were impressed with the Triton’s off-road performance. 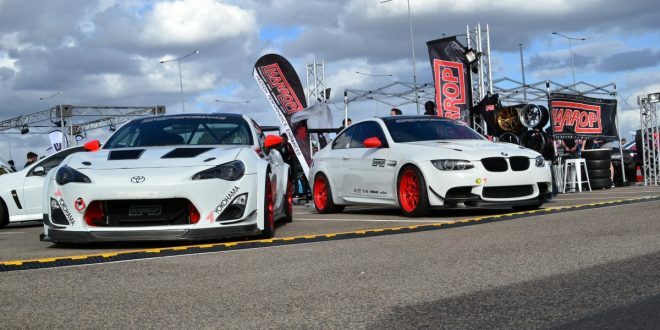 With a fairly solid 220mm ground clearance, we never encountered any major clearance issues, while its very good 31-degree approach angle ensured no damage was inflicted on that flashy new bumper. 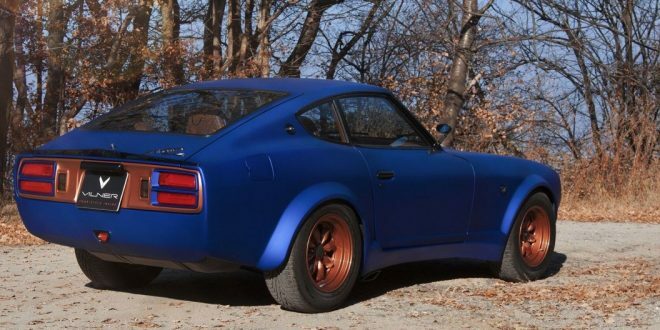 It’s worth noting there’s also a good amount of articulation from that rear axle, too. Overall, the Triton doesn’t feel as though its lacking anywhere compared to its more expensive rivals other than when it comes to power. 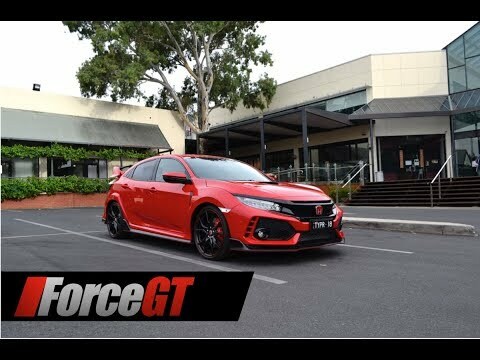 With fairly impressive on-road ride quality and strong off-road performance, it only needs a bit more grunt to make it the full package. 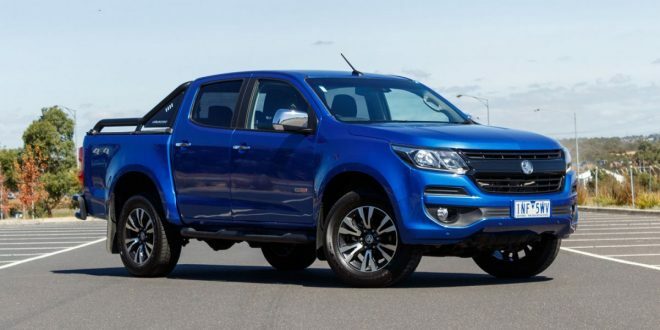 At the time of publication, the Triton is being offered with a seven-year/150,000km warranty, which makes it the only ute to offer seven years coverage other than the smaller SsangYong Musso. 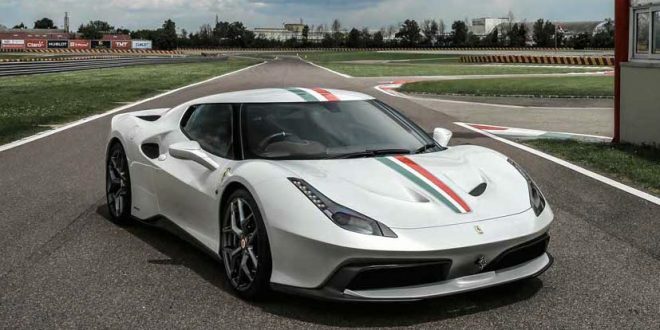 However, this deal is currently only slated to run until June 30, 2019 at which time it would revert to the company’s standard five-year/100,000km warranty. Also as part of this deal, the Triton is being offered with three years capped price servicing, which sees the first three services – required every 12 months or 15,000km – priced at $299 a pop. 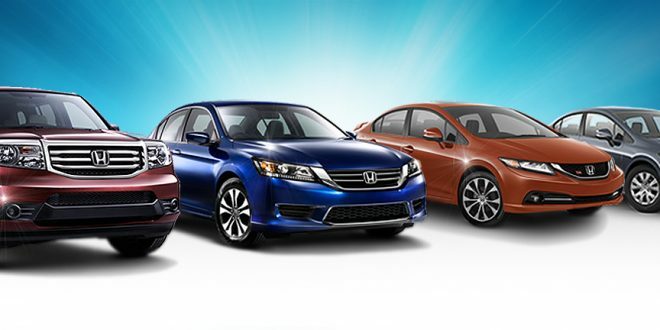 While that price is certainly very good, we would, however, like to see a longer period of capped price servicing offered. Additionally, as previously mentioned, we were impressed by the Triton’s fuel usage under real-world conditions, and its near-700km range per tank, so fuelling is, to an extent, one cost that shouldn’t be as high as it is for some rivals. While opinions on the new looks may be split, there’s no doubt that the Triton is one of the best value-for-money propositions in the ute market. 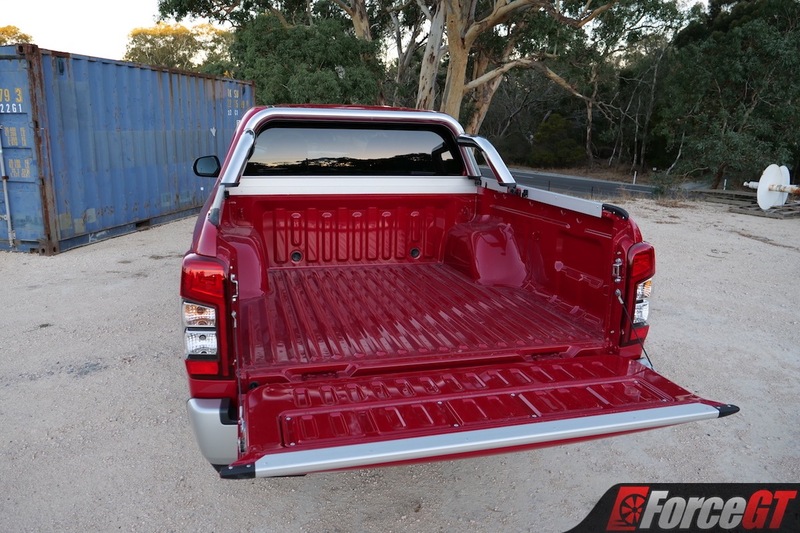 With more active safety tech than most rivals offer, this is one ute we feel comfortable recommending to buyers looking to use their ute as a family bus as well as a workhorse, while its many convenience features make it pleasant to live with day-to-day, too. 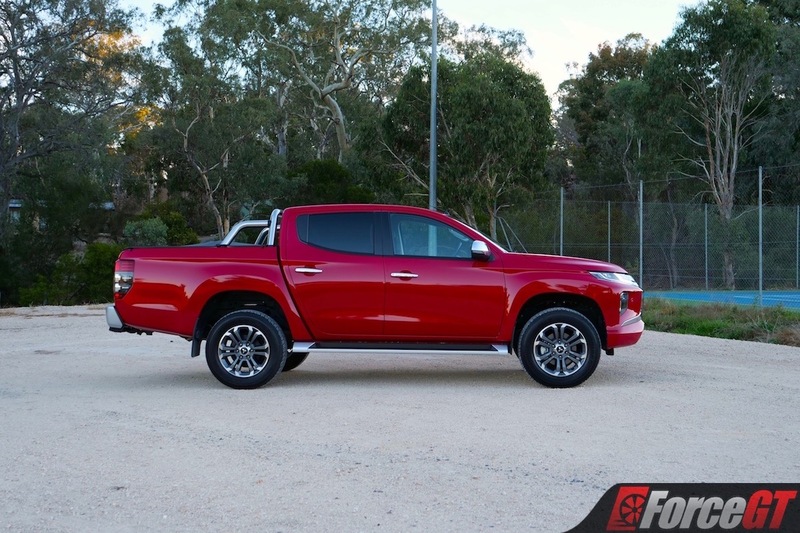 Overall, the Triton is an awful lot of ute for the money, and its many features are the icing on the cake – it’s just that a bit more power would be the missing cherry on top.